Background Clinical outcomes in fungal keratitis vary between Fusarium and Aspergillus spp, therefore distinguishing between species using morphological features such as filament branching angles, sporulation along filaments (adventitious sporulation) or dichotomous branching may be useful. In this study, we assessed these three features within Heidelberg Retina Tomograph 3 in vivo confocal microscopy (IVCM) images from culture-positive Fusarium and Aspergillus spp keratitis participants. Methods Prospective observational cohort study in Aravind Eye Hospital (February 2011–February 2012). Eligibility criteria: age ≥18 years, stromal infiltrate ≥3 mm diameter, Fusarium or Aspergillus spp culture-positive. Exclusion criteria: previous/current herpetic keratitis, visual acuity <6/60 in fellow eye, >80% corneal thinning. IVCM was performed and images analysed for branch angle, presence/absence of adventitious sporulation or dichotomous branching by a grader masked to the microbiological diagnosis. Results 98 participants were included (106 eligible, 8 excluded as no measurable branch angles); 68 were positive for Fusarium spp, 30 for Aspergillus spp. Mean branch angle for Fusarium spp was 59.7° (95% CI 57.7° to 61.8°), and for Aspergillus spp was 63.3° (95% CI 60.8° to 65.8°), p=0.07. No adventitious sporulation was detected in Fusarium spp ulcers. Dichotomous branching was detected in 11 ulcers (7 Aspergillus spp, 4 Fusarium spp). Conclusions There was very little difference in the branching angle of Fusarium and Aspergillus spp. Adventitious sporulation was not detected and dichotomous branching was infrequently seen. Although IVCM remains a valuable tool to detect fungal filaments in fungal keratitis, it cannot be used to distinguish Fusarium from Aspergillus spp and culture remains essential to determine fungal species. At present, microbiological culture of corneal scrapings remains the standard method of identifying the causative organism in fungal keratitis. Morphological features of fungal colonies and spores allow accurate identification of the fungal species, but require an experienced microbiologist and can take up to 7 days for fungi to grow and sporulate in culture.5 In contrast, the high-resolution imaging modality of in vivo confocal microscopy (IVCM) provides immediate visualisation of filamentous fungi within the living cornea.6 Previous case reports have described the IVCM appearances of filaments or hyphae of Aspergillus spp in patients as well as animal models of keratitis; Aspergillus fumigatus hyphae were reported to measure up to 3–10 microns in diameter, 200–400 microns in length and have hyphal branches emerging at 45° from the parent hyphae.6 ,7 Some have postulated that the branching patterns of fungi as seen in IVCM images of keratitis could be used to differentiate fungal species. Brasnu et al8 analysed IVCM images of keratitis obtained using the Heidelberg Retina Tomograph (HRT)II confocal microscope (Heidelberg Engineering, Heidelberg, Germany) in four patients with Fusarium spp infection, and donor corneas infected in vitro with A. fumigatus and Fusarium solani. Fusarium spp filaments were reported to be 3–5 microns in diameter, 200–300 microns in length, with a hyphal branching angle of 90° in IVCM images from patients and from the infected donor cornea. For A. fumigatus, the branching angle in the infected donor cornea was measured as 45°.8 In contrast to these IVCM findings, reports of histopathological examination of fungal hyphae in tissue sections show that acute angle branching may occur in both Fusarium and Aspergillus spp.9 Other morphological traits have also been proposed as potential diagnostic features of certain fungi in histopathology, for example, presence of spores along hyphae (known as adventitious sporulation) in tissue samples from Fusarium keratitis.10 Also, in Aspergillus spp, the apical filament can directly bifurcate instead of generating side branches—this is known as dichotomous branching.9 To our knowledge, these features have not as yet been studied in IVCM images of fungal keratitis. 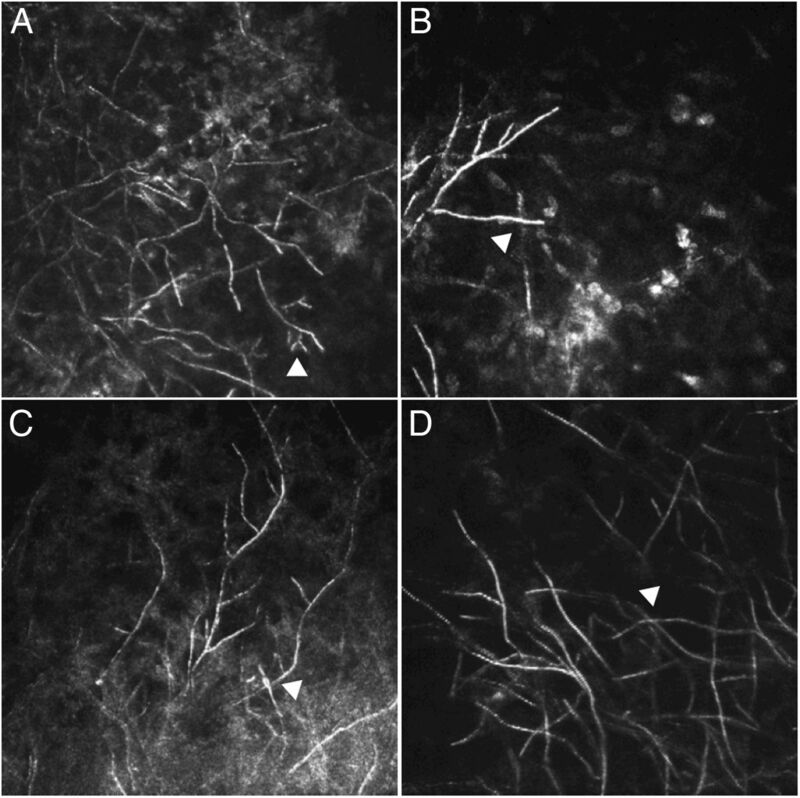 In this study, we investigated whether hyphal branching angles measured using IVCM images from patients with fungal keratitis differed between culture-positive Fusarium and Aspergillus spp corneal ulcers, and also assessed whether adventitious sporulation or dichotomous branching could be detected using IVCM. This study was approved by the Indian Council of Medical Research, as well as the Ethics committees of Aravind Eye Care System, India and the London School of Hygiene and Tropical Medicine, UK. Tenets of the Declaration of Helsinki were adhered to in conduct of this study. Participants were enrolled after they had given their written informed consent, or a thumbprint to indicate consent in illiterate participants, witnessed by a study team member, as approved by the ethics committees. Patients with clinically suspected microbial keratitis presenting to the Cornea Clinic at Aravind Eye Hospital, Madurai, Tamil Nadu (India) between February 2011 and February 2012 were assessed for eligibility to enter the study. Eligibility criteria were: age ≥18 years, corneal ulcer measuring ≥3 mm in longest diameter of stromal infiltrate and extending ≥1/3 of the corneal thickness, with an overlying epithelial defect and evidence of acute inflammation (ie, conjunctival injection and/or either anterior chamber cells, flare or hypopyon). Exclusion criteria were: previous or current herpetic keratitis, fellow eye visual acuity <6/60, descemetocele or >80% corneal thinning as assessed on slit lamp examination (due to inability to safely applanate the cornea for IVCM). The corneal ulcer was imaged according to a standard protocol, as previously described.11 The HRT3 laser scanning confocal microscope with Rostock Corneal Module (Heidelberg Engineering, Germany) was used for all IVCM imaging in this study. Briefly, the confocal microscopist applanated the IVCM onto the cornea anaesthetised with 0.5% proparacaine eye drops (Aurocaine, Aurolab, Madurai, India), and a new IVCM sterile disposable cap was used for each patient. After manually focusing, a series of volume scans was recorded at the centre and margins of the ulcer (12, 3, 6 and 9 o'clock positions), with overlapping volume scans taken from surface epithelium to the deepest region of the ulcer that could be imaged. Each volume scan had a z-stack of 40 sections, each section measuring 400 μm×400 μm (384×384 pixels) with optical thickness of 2 μm. IVCM image sets had patient-identifying data and microbiological diagnoses removed and were allocated a random study number. All image sets were shuffled into a random order before measurements were performed. Every branching hyphae present in each IVCM image within each section of each volume scan was measured by a single IVCM grader (JDC), who was masked to the microbiological diagnosis. Volume scan z-stacks were imported into ImageJ V.1 analysis software (National Institutes of Health, Bethesda, Maryland, USA) as best resolution jpeg files. For each participant, all measurable branch angles present in all section images were measured; all 40 sections in every volume scan were screened and measured for each participant. Branch angles were measured using the angle tool in ImageJ V.1. Presence or absence of dichotomous branching in all sections was also assessed. Data were recorded in Microsoft Excel for Mac 2011 (V.14.6.5). All analyses were performed with Stata V.12.1 (StataCorp, College Station, Texas, USA). Difference in baseline demographic features between each group were compared using the Kruskal-Wallis test for non-normally distributed variables (age, symptom duration, ulcer size) and χ2 test for proportions (gender, prior drug use, presence of diabetes, presence of deep infiltrate). Branch angles were analysed as clustered data by patient, using a linear mixed-effects model (xtmixed) with restricted maximum likelihood estimation (reml); backwards stepwise regression was used to select predictor variables with likelihood ratio tests used for significance testing at each stage. A threshold value of p=0.10 was used for exclusion of variables, leaving fungal species, presence of a deep ulcer and prior antifungal use in the multivariate regression model, with adjustment for age and gender. During February 2012–February 2013, 106 patients with keratitis were recruited, who were culture positive for Fusarium or Aspergillus spp. These patients form part of a larger cohort of 239 patients with microbial keratitis for whom we calculated the sensitivity (85.7%; 95% CI 82.2% to 88.6%) and specificity (81.4%; 95% CI 76.0% to 85.9%) of IVCM in the diagnosis of fungal keratitis compared with culture and light microscopy, full results published elsewhere.15 Eight patients were excluded from the IVCM analysis (5 Fusarium spp, 2 Aspergillus flavus, 1 A. fumigatus) due to the absence of any measurable branching hyphae in the IVCM images. In the remaining 98 participants, 68 were culture-positive for Fusarium spp, 24 for A. flavus, 4 for A. fumigatus and 2 for Aspergillus terreus. A median of 11 IVCM volume scans were obtained for each patient (range 3–28). A total of 1254 images were assessed for presence of any branching angle. Branch angles were detected and measured in 627 images in total (median 5 images measured per patient, range 1–19). There was no significant difference between the Fusarium and Aspergillus spp groups in gender, ulcer stromal infiltrate size, presence/absence of diabetes mellitus or prior use of topical antifungals or steroid (see table 1). Participants who were culture positive for Aspergillus spp were older compared with those with Fusarium spp (median age 54 vs 45 years), and had a longer median symptom duration (7 vs 5 days, see table 1). A higher proportion of patients with Aspergillus-positive keratitis presented with deep ulcers involving the posterior third of the cornea compared with the Fusarium-positive group (80% vs 54%, see table 1). Data on topical medication used prior to presentation were available for 87 patients, of whom 45% (n=39) had used an antifungal beforehand, specifically 21% (n=18) had used a polyene antifungal (eg, natamycin), 6% (n=5) had used an azole antifungal (eg, voriconazole) and 18% (n=16) had used both drugs. Also, 10% (n=9) had used a topical steroid, 2% had used a steroid in conjunction with an antifungal. A small number of patients had a coexisting diagnosis of diabetes mellitus (n=11); evidence was very weak (p=0.068) of an association between diabetes and fungal species. The mean branching angle for filaments of Fusarium spp was 59.7° (95% CI 57.7° to 61.8°) and for Aspergillus spp was 63.3° (95% CI 60.8° to 65.8°). The small difference in branching angle between the two species did not reach significance at the 5% level in univariate analysis, but became significant when adjusting for age and gender (table 2). Figure 1 shows IVCM images from culture-positive Fusarium and Aspergillus spp ulcers, highlighting the similarity in branching structure. Branching angle from all species together were not significantly affected by symptom duration, presence of diabetes mellitus, ulcer size or prior steroid or antifungal use (table 2). Multivariate analysis including depth of ulcer, adjusting for age and gender, showed that the branching angle for Aspergillus spp was 4.8° greater than for Fusarium spp (95% CI 1.0° to 8.5°, p=0.012) and that deeper ulcers had a branching angle of 4.0° smaller than all others (95% CI −0.3° to −7.7°, p=0.034; see table 3). In vivo confocal microscopy (IVCM) images of keratitis caused by (A) Aspergillus flavus and (B), (C) and (D) Fusarium spp (image size 400×400 microns). All branching angles detected in all images measured <78°. Arrowhead in (A) shows dichotomous branching and in (B) shows two fungal filaments overlapping giving the false impression of a 90° branch angle. (C) and (D) show IVCM images representative of the keratitis seen in this study with arrowheads showing overlapping filaments. Among Fusarium spp ulcers, deep ulcers had a smaller branch angle by 4.3° (57.8° (95% CI 55.0° to 60.6°) vs 62.1° (95% CI 59.2° to 64.9°) in superficial ulcers; p=0.037). Deep Aspergillus spp ulcers also had smaller branch angles but the difference did not reach statistical significance (62.7° (95% CI 59.6° to 65.8°) vs 65.1° (95% CI 61.0° to 69.2°), p=0.444). Prior antifungal use also caused a significant reduction in branch angle among Fusarium spp, but only by 5.9° (56.6° (95% CI 52.6° to 60.6°) vs 62.5° (95% CI 60.2° to 64.9°); p=0.037). However, there was no significant effect of antifungal use on branch angle in Aspergillus spp (63.4° (95% CI 60.2° to 66.6°) vs no antifungal use 63.2° (95% CI 59.3° to 67.1°); p=0.99). Only five corneal ulcers had a mean fungal branching angle ≤45°, of these four were culture positive for Fusarium spp and one for A. flavus. The remaining ulcers had mean branching angles of >45° and were positive for Fusarium spp (n=64) or Aspergillus spp (n=29). Two ulcers had at least one branch angle measured as 90° and both were caused by Fusarium spp. There was a small variation in the mean branching angle within the Aspergillus spp, with the smallest being A. fumigatus at 59.1° (95% CI 53.5° to 64.6°), then A. flavus at 63.4° (95% CI 60.4° to 66.4°), and finally A. terreus at 68.9° (95% CI 58.4° to 79.5°). Presence or absence of dichotomous branching was assessed in 92 patients (total 203 images, median 2 images per patient, range 1–10); image sets from six patients were excluded as the fungal filaments in the images were inadequate to detect this feature. Dichotomous branching was infrequently seen, detected in only seven ulcers in the Aspergillus spp group, compared with four in the Fusarium spp group (25.9% vs 6.1%). All Fusarium spp ulcer images were assessed for presence of any adventitious sporulation, but this morphological feature was not detected in any of these images. Fungal filament appearance, branching angle and growth can be affected by several factors, including topography of the host tissue,21 local availability of oxygen or nutrients (eg, glucose), tendency to grow away from neighbouring hyphae (known as negative autotropism) as well as health of the fungal cell wall and cell membrane.22 Both polyene and the azole antifungals act on ergosterol, a major component of the fungal cell membrane, to disrupt hyphal growth.23 ,24 Both Fusarium and Aspergillus spp had smaller branch angles when treated with antifungal prior to presentation or in deep ulcers but only reaching statistical significance for Fusarium spp. However, the magnitude of this effect (ie, <6° at most) was very small and therefore may not have masked any true difference in branch angle between the two species. Further studies are therefore required to more fully explore the impact of different antifungals on fungal morphology. In addition to branch angle, other characteristic morphological features have been noted in culture and/or histopathology for some keratitis-causing fungi. Fusarium, Acremonium and Paecilomyces spp can sometimes develop spores within the infected tissue, known as adventitious sporulation, and this has also been detected in keratitis.10 In our series of Fusarium-positive ulcers, we were unable to detect adventitial sporulation. This may be due to the size of the fungal spores reaching the limits of resolution of the laser scanning HRT confocal microscope (ie, 2 microns laterally).13 ,25 Aspergillus spp have been described to have dichotomous branching, where the tip of the distal fungal hyphae splits into two branches.9 Although we did detect this phenomenon in a higher proportion of ulcers positive for Aspergillus spp than in the Fusarium spp, further studies with a larger sample of Aspergillus keratitis are required to confirm this finding. This study had several limitations. The IVCM images obtained in this study were two-dimensional and therefore the three-dimensional (3D) structure of the fungal mycelium growing within the entire cornea could not fully be appreciated. Advances in IVCM imaging may allow 3D reconstruction of HRT3/Rostock Corneal Module images of the entire cornea in the future,25 thus enabling research into the relationship between hyphal growth, branching and tissue topography. We found that the majority of ulcers in the study were culture positive for Fusarium spp. This pattern of increased incidence of keratitis due to Fusarium spp in this geographical region has been previously reported.2 Participants with culture-positive Aspergillus spp ulcers more frequently had a longer symptom duration and deeper corneal involvement at presentation, but all of these parameters still only impacted on branch angle by a few degrees. In summary, we have found very little difference between the hyphal branching angle in IVCM images taken from culture-positive Fusarium and Aspergillus spp ulcers. Although IVCM remains a valuable tool to detect fungal filaments in corneal ulcers, it cannot be used to distinguish Fusarium spp from Aspergillus spp and culture remains essential to determine fungal species. The authors wish to thank all staff in the Cornea and Microbiology Departments at Aravind Eye Hospital as well as the study participants for their kind help in this study.
. Cumitech 13A: laboratory diagnosis of ocular infections. Washington DC: American Society of Microbiology Press, 1994.
. Aravind's Atlas of Fungal Corneal Ulcers: Clinical Features and Laboratory Identification Methods. India: Jaypee Brothers Medical Publishers, 2008.
. Kinetics of Filamentous Growth and Branching. The Growing Fungus. London, UK: Chapman and Hall, 1995. Contributors Conception and design: JDC, NVP, NL, MJB. Data acquisition: JDC, PS, SL, MS, PL, SE. Data analysis/interpretation: JDC, NL, DM, MJB. Manuscript preparation: JDC, DM, MJB. Manuscript critical revision/approval of final version: all authors. All authors agree to be accountable for all aspects of the work and will ensure that any questions that may arise related to the accuracy or integrity of any part of the work will be appropriately investigated and resolved. Funding This work was supported by the Wellcome Trust grant no. 097437/Z/11/Z to JDC. Ethics approval Ethics Committees of London School of Hygiene and Tropical Medicine, Aravind Eye Hospital and Indian Council for Medical Research.